Meghan Phelps-Roper, granddaughter of the (in)famous Fred Phelps, leader of the Westboro Baptist Church, has left the WBC group and her family and is repenting of her prior beliefs and behaviors, including the protesting of funerals and “God hates fags” signs, as she grapples with what it means to really love and follow Jesus and live out the Gospel in authentic and real ways. Her story is partially told here by author Jeff Chu — definitely worth reading! One of the things that struck me about Chu’s writing about WBC, was his un-willingness to simply dismiss them as dehumanized evil. He treats them like people, with stories. People he disagreed with, but who wanted and longed for similar things that we do. People who authentically thought they were right and doing good. Wrong, and misguided, but still brothers and sisters in Christ. In short, Jeff approached them and wrote about them with grace. And I think that this grace, among other factors, had a transformative impact on at least one member of the group. Many Christians I know have no way of talking about or interacting with WBC a part from hatred for them. Almost universally, Christians I know dismiss them as not being Christians, of just being evil, etc. I get this. I’ve done it. But it is not right or accurate. Our posture should always be grace, even as we openly and strongly condemn their theology and actions. I think it is somehow easier for gay Christians to get this balance. We know what it can be like to be treated and assumed to not be “real” Christians, while at the same time having a dynamic and intimate relationship with Jesus. Many in the traditionalist church, assume that “gay Christian” is an oxymoron because you CANNOT be both gay and Christian. And yet, here we are! 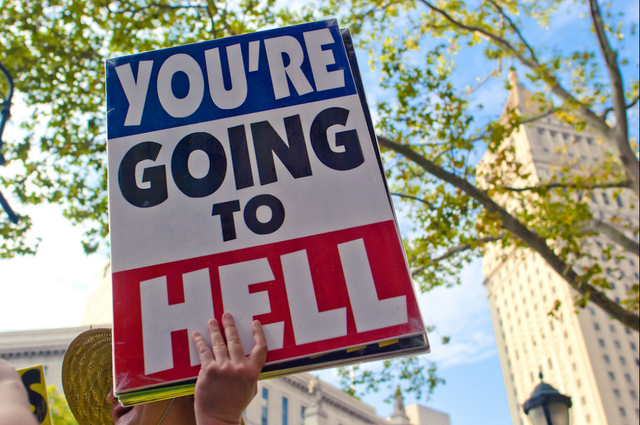 So I am pretty hesitant to dismiss the faith of others — even those at WBC. And I am even more hesitant to give up on anybody — even those at WBC. Grace means that no one is beyond God’s redemptive work. Grace means that God never gives up on anyone. Grace means that Jesus is greater than our worst failures, doubts or heresies. Grace means that there is nothing we can do, either good or bad, that will ever change how much God loves us right now. Grace means God loves us as we are, not as we should be — because we will never be as we should be. We have received grace, and therefore MUST extend grace to those around us! Thanks Jeff for that lesson… and thanks Meghan for your story.